Are you see that Microsoft disabled hibernate option in windows 8 and earlier version windows 8.1? Why Microsoft do that? Because windows 8 and 8.1 boot up and shut down faster than older version (like windows 7 and xp). Lots of feature added in windows 8, like start screen, picture password and many more. But I am not describe all features of windows 8. I will be showing you how can I enable hibernate option in windows 8. Continue reading…..
Before I complete this topic let us have a short description about what is hibernate? hibernation is powering down a computer. In this mode the current state of the system is saved to the hard drive, and the system will power down. When a user turns the system power back on, the saved information is read from the hard disk, restoring the last used settings. Hibernation mode is similar to sleep mode, however in sleep mode the power cannot be shut off. Why I enable hibernate feature in windows 8? Hibernation option save more power without losing any file. It automatically save your files into hard drive. I am using sleep option to save power but that is not enough. Because when I turned my pc into sleep mode, then only my monitor will be off but computer still running and when I use sleep option my pc is going to sleep mode and I walk away but in this time when lights gone and when I come back after few minutes ago and turned on my pc my files are not saved its totally removed. Then I use hibernate option to save my work and power. In this option when lights off and after some times when you power on your pc all files are saved. 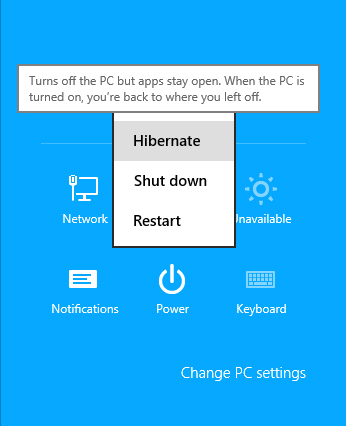 Windows 8 disable hibernate option but we can easily enable it. Just followed my simple steps. Open control panel and click on windows power option and it display new screen. Now in left side you will see the option – Choose What the Power Button do, click on it. Now Scroll Down to “Shutdown Settings” Section, and Check Hibernate box to Enable it and Click on Save Changes. Now all is done then, now go to power option and see the hibernate option there. Now you will see hibernation option are there and you can hibernating your computer. It is pretty simple and its works. Enjoy all new features of windows 8 and save more power by enable hibernate windows 8. Hope this help you! As you already know I’m a dumb in field of Computer software and hardware information. Even I was not aware what hybernate is. Definitely I need to use hybernate option because I can’t keep my PC in safe mode as you already told it don’t keep the files saved. I need to know from you that will hybernate option continue our downloading in progress?? If I am downloading any file from internet then can I hybernate my PC? First of all a great design of your website I must say. And yeah this was the thing i was looking for that you have provided that how can I enable option for hybernate in windows 8. Thanks for providing a wonderful and helpful article that provides each and every tip that I would require on the topic. Thanks again. keep the good work going. Well, I was looking for such kind of PC tips and tricks and yet, today I learned another great trick. Though there’s probably many who are unable to save their Laptop battery or save power, though this would be an ideal way to conserve the battery power. Thanks for the great contribution, have a great weekend. First I want to say thanks to share this awesome post with us, Hibernate is really most important future when we need to shut down system suddenly, it works best to save all active window in active mode and get back in the same state when we turn on computer. no bro in hibernate option you can’t continue your downloading but use sleep mode for your need. Thanks for providing great info about Windows 8. This is really a good guide for all internet users. Thanks again. Keep writing and sharing such a good info. this is really very helpful tricks.. thanks..